Bungie studios has officially handed over most of the reins of Halo Reach to 343 Industries. With their first outing, 343 let loose a barrage of past Halo warriors known as Certain Affinity to develop the latest Defiant Map Pack. Let’s take a closer look at the 3 newest maps for Bungie’s swan song. Set among the mountainous terrain of Reach are these two UNSC bases. This map is built for large scale vehicular combat but with plenty of spice for infantry clashes. Just don’t expect to make the flag run back in a single try unless you have ridiculous ninja skills. This asymmetric map features two main starting bases, similar in set up with a large military hangar on one side and a glistening waterfall and underwater walkway on the other. Each base comes stock with a warthog and mongoose while a ghost can be found on the waterfall walkway. The connecting battlefield is divided up by rugged terrain, small streams, and every other type of obstacle you would expect to find on a planet-size struggle. Certain Affinity has decided to throw every imaginable color at us with crisp blue streams, bright green grass, and jagged grays and browns in the rock formations. One of the best features of this map is in the skybox. A covenant cruiser actively “glassing” the planet in the background really sets the mood of the map. Each defiant map is set within the doomed story of Reach. The gameplay on this map with the default hopper can get stale fast only because this map is best suited for more than a 6 on 6. Nearly every weapon in the game is featured on the map including the Splaser, Rocket Launcher, Plasma Launcher, Sniper Rifle, and even the Grenade Launcher. This really solidifies this as a great big team map since vehicles can’t consistently control the level. Continuing the doomed planet theme is what’s left of a space station in a failing orbit above Reach. Yes, Anchor 9 was also a space station map above Reach, however that station was still intact. Condemned must have been one of the first defenses against the Covenant invasion because there isn’t much left of it. Another asymmetric entry into the Halo universe, this map features several smaller rooms around a central hub of a room. (I refer to this room as the Noogie Room – No G Room) This central hub has a bit if a gimmick to it. It has the one and only rocket launcher…however this room also has very little gravity left to it. Jump in this room and you are a floating duck with the rest of the debris. You will also lose most sound in this room because in space no one can hear you pew. Dividing this area from the rest of the map are several shield doors which do not act like the easily abused shield doors from Halo 3. You can shoot and throw grenades through these doors which catch many people off guard the first time around. Also for a smaller note, when you throw a grenade into low g environment in Reach, it travels in a straight line and does not arc like normal. The extra rooms are all labeled with a central piece of environment such as a hologram, a sabre, staircase, color etc. These help to maintain a sense of where you are however after several tries; I still have yet to find out where the hell I am. There is one section by a staircase that showcases another amazing skybox. You can watch a UNSC ship and Covenant Cruiser engage in an epic pew pew match. It seems like this would make a good 1 flag map, however all my lobbies keep voting for some form of slayer for this one and it holds up well. This is the first firefight DLC ever for a Halo game and boy does it deliver. 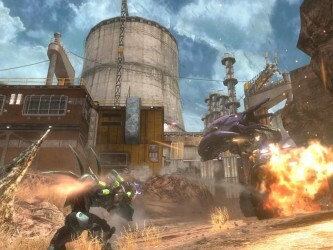 Set in an abandoned mining facility somewhere on Reach is this massive firefight environment. Certain Affinity said they looked to deliver a more vehicular fun firefight map and this was perfect. A default Rocket Hog spawns with enough room to run entire laps in and around the map while you and your friends wreak havoc on the invading Covenant. This map has so many areas for the Covenant to come from that you cannot keep in one area for the entire round. The covenant will drop or spawn above or behind you in almost every wave. I do not recommend this map for a Score Attack Skirmageddon. If you think shooting skirmishers on an open canvas is hard, this map gives them so much cover that you might as well throw grapes at them, nothing will hit them. This map really gives me the feel of Halo CE fun. Just grab some friends, some drinks, and hop in the hog and completely tear the Covenant a new one on this map. Just beware on Legendary, the A.I. will make fast disposal of that hog if you stop for more than 1.1 seconds. Certain Affinity clearly shows their Halo background and love for the series with this nice addition. At 800ms points it is entirely worth it. Now Reach’s population isn’t what the Halo population used to be but you have to remember that Halo MADE the console FPS genre what it is today. Without CE, Halo 2, we would not have CoD, Crysis, or any other decent console FPS with great multiplayer. Give the devil his due here and contribute to a great community and play Reach for being Reach and not being Halo 3.5.